Ever since the Titans first appeared in her Detroit neighborhood, Astrid Sullivan’s world has revolved around the mechanical horses. She and her best friend have spent countless hours watching them and their jockeys practice on the track. It’s not just the thrill of the race. It’s the engineering of the horses and the way they’re programmed to seem so lifelike. The Titans are everything that fascinates Astrid, and nothing she’ll ever touch.She hates them a little, too. Her dad lost everything betting on the Titans. And the races are a reminder of the gap between the rich jockeys who can afford the expensive machines to ride, and the working class friends and neighbors of Astrid’s who wager on them.But when Astrid’s offered a chance to enter an early model Titan in this year’s derby, well, she decides to risk it all. Because for a girl from the wrong side of the tracks, it’s more than a chance at fame or money. Betting on herself is the only way she can see to hang on to everyone in the world she cares about. Oh gosh…this is going to be a tough review for me to write because even now I am on the verge of crying. This book turned out to be so emotional because of certain events that took place in the book but more to the fact that this book is a stand-a-lone. Am I happy? That is the perfect question. Well let me tell you in the best way that I possibly can. 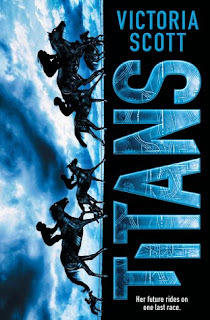 The story follows a girl, Astrid, who has grown up following and watching the Titans, mechanical horses who race. However, after her dad loses all of their money gambling in the races, there is a slight hate growing inside Astrid. Nevertheless, when offered to take part in the races and have a chance of getting her family out of the economic problem they currently face, she jumps at the idea and from this moment on her life is forever changed. Astrid is a girl who doesn’t let her family issues hold her back. She is a strong female dominant character who will do whatever she can to obtain anything she sets her mind on. She is so set on winning that the idea of falling in love, seeing beyond the mechanics of her horse has her stumble on her own thoughts and makes her look at the idea of what the cost of winning could mean. Yes, Disney’s Secretariat! I have no idea if this movie provides any inspiration for this book but there was so many moments where I felt I was reliving the movie and I ended up watching the movie when I was done. This connection is such a beautiful thing that this is what made me this book such an emotional ride for me. Victoria Scott brings up class systems and how sometimes we overlook people in positions lower than us and how no matter your background there is something special in everyone and there will be a time for you to shine. I literally cried for a good hour when turning the last page because of the ending. I really didn’t know what to do with myself. I know, embarrassing. This is a book though I could read over and over again. I am so glad this book was suggested for me to read and I am so glad I gave myself to its pages and let myself be taken on an adventure that has left an impact in me. I will definitely be checking out Victoria Scott in the person. She is such a lovely author that you should hate yourself for not checking out her books. Titans is a book that is a 2016 must for all readers and it is a book that will forever have a spot on my top reads. Great review, Chayse!! Now I want to read it too!! I will squeeze it in next time I am in the mood for a tear jerker!